We felt honored to enjoy the company of so many influential leaders at the 2013 AANP Conference in Keystone, CO.
Allison Greenberg, ND began her residency with Federal Way Naturopathy and Synergy Health in October 2013. The Origins of Naturopathic Medicine is the first volume of a 12-volume series, The Hevert Collection: In their Own Words. The collection restores that lost heritage for naturopathic physicians and other healthcare professionals drawn to understand the simplicity of medical practices and tools still in use today. On June 5th, 2013, Governor John Hickenlooper signed into law a measure to allow naturopathic doctors to register with the state to legally practice naturopathic medicine. Colorado became the 17th state to do so, along with the District of Columbia. ILANP held their first annual conference November 16–17, 2013, in Lombard, Illinois. 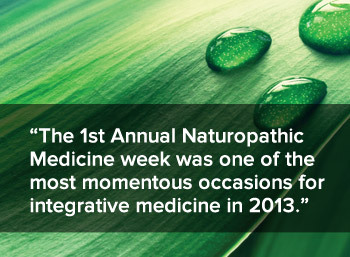 Continuing the efforts to establish, or re-establish, licensure for Naturopathic Doctors across the nation. Many states have been working relentlessly in 2013 to pass legislation to allow qualified Naturopathic Doctors to practice primary healthcare. FNPA is one such organization. $5000 in scholarship awards to be given to naturopathic students in CNME-accredited programs as they play an active role in presenting case studies and research reviews. What moments have made you proud in 2013?